Common Nighthawk: Ryan Cathers Photo. The Sunday Bird Walk went to Beck Creek in south Nanaimo. The morning was sunny but there was a strong wind off the water. We observed a great deal of activity around the Purple Martin nests on the estuary. Many Turkey Vultures flew overhead throughout the morning. Canada Goose, Great Blue Heron, Turkey Vulture, Bald Eagle, California Gull, Glaucous-winged Gull, Band-tailed Pigeon, Rock Pigeon, Belted Kingfisher, Rufous Hummingbird, Yellow Warbler, Northern Flicker, Northwestern Crow, Common Raven, Purple Martin, Barn Swallow, Chestnut-backed Chickadee, Red-breasted Nuthatch, Brown Creeper, Bewick's Wren, Bushtit, Golden-crowned Kinglet, European Starling, Swainson's Thrush, Western Tanager, American Robin, Cedar Waxwing, Spotted Towhee, Song Sparrow, House Finch, American Goldfinch, Red-winged Blackbird, House Sparrow. Two Osprey were seen in a nest at Bowen Park in Nanaimo. Four Merlins have make their home on Sugarloaf Mountain in Nanaimo. Western Tanager, Black-throated Grey Warbler, Pacific-slope Flycatcher, Swainson's Thrush were seen along with Belted Kingfishers and Northern Rough-winged Swallows that are nesting in a sand cliff above the Little Qualicum River in the Cedar Grove Campground in Qualicum Beach. A Black-headed Grosbeak is a frequent visitor to feeders along Meridian Way in Parksville. Fifty-six Common Nighthawks and three Vaux's swifts flew by from east to west over the 2500 Block of Glenayr Drive in Nanaimo. A Semipalmated Plover, a Semipalmated Sandpiper along with several Western and Least Sandpipers were seen at the mud flats on the Plummer Road side of the Englishman River Estuary in Parksville. A Vesper Sparrow, seven Turkey Vultures and two House Finch were heard and seen over the Cassidy Airport in south Nanaimo. Twenty-four Common Nighthawks were spotted flying over Northfield Road in Nanaimo. An Osprey was seen heading towards Westwood Lake in Nanaimo. An Osprey was spotted in the pond at the bottom of the hill at Nanaimo North Town Centre in north Nanaimo. A large flock of over thirty Common Nighthawks was seen flying above the Nanaimo Golf Club along highway 19A. Over seventy Common Nighthawks and twenty Black Swifts were seen hawking insects in a spectacular twinkling 'ballet' flight over the 2500 block of Glenayr Drive in Nanaimo. Turkey Vulture, Black Swift, Vaux's Swift, Rufous Hummingbird, Hairy Woodpecker, Pileated Woodpecker, Olive-sided Flycatcher, Hammond's Flycatcher, Pacific-slope Flycatcher, Cassin's Vireo, Hutton's Vireo, Warbling Vireo, Northern Flicker, Steller's Jay, Northwestern Crow, Common Raven, Purple Martin, Violet-green Swallow, Chestnut-backed Chickadee, Red-breasted Nuthatch, Bewick's Wren, Winter Wren, Brown Creeper, Golden-crowned Kinglet, Swainson's Thrush, American Robin, Varied Thrush, Black-throated Gray Warbler, Townsend's Warbler, MacGillivray's Warbler, Wilson's Warbler, Spotted Towhee, Western Tanager, Song Sparrow, White-crowned Sparrow, Dark-eyed Junco, Black-headed Grosbeak, Red Crossbill, Pine Siskin, American Goldfinch, and Evening Grosbeak were seen in the forest at Lot33 in Nanoose Bay. Canada Goose, Merlin, Killdeer, Spotted Sandpiper, Semipalmated Sandpiper, Western Sandpiper, Least Sandpiper, California Gull, Glaucous-winged Gull, Pigeon Guillemot, Marbled Murrelet, Belted Kingfisher, Bushtit, European Starling, Cedar Waxwing and Orange-crowned Warbler were seen on the Plummer Road side of the Englishman River Estuary in Parksville. A Wandering Tattler and a Marbled Murrelet were seen off Amphimite Point at Tofino. A Western Tanager was seen in a backyard at the northend of Gabriola Island. A Common Nighthawk was calling loudly, and hawking insects at close range and made a few dramatic dives that produced wing-whistle as it pulled out above Colbourne Drive in North Nanaimo. A family of Merlin was spotted in a yard in Yellowpoint at Cedar. 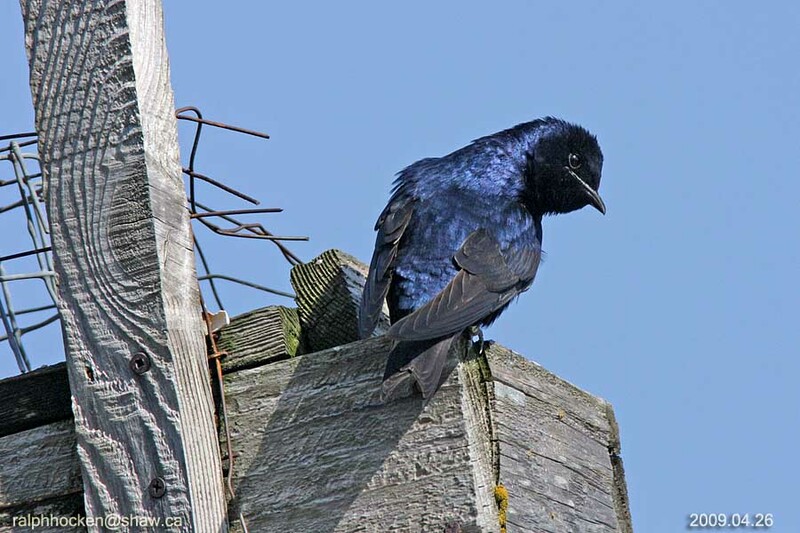 Two Purple Martins were observed hawking bugs and scooping water near the dyke and old observation tower. An Eurasian Collared Dove was seen perched on a snag at the back of the trailer court at Buttertubs Marsh in Nanaimo. An Eurasian Collared Dove has been seen among backyard trees along Honeysuckle Terrace in Nanaimo. A Stellar's Jay was seen in a backyard at the east end of Lost Lake Road in Nanaimo. The Sunday Bird Walk on August 01, 2010 will be going to the Plummer Road side of the Englishman River Estuary in Parksville. We will meet at The Backyard Bird Store at 9:00 A.M. or at the parking area at the corner of Plummer Road and Shorewood Drive in Parksville at about 9:25 A.M. The Sunday Bird Walk went to Maritime Society Marina at Ladysmith Harbour in Ladysmith. The morning was sunny with a breeze blowing off the Strait of Georgia. The highlight was the sighting of the forty-five pairs of Purple Martins nesting on the harbour. Double-crested Cormorant,Great Blue Heron, Bald Eagle, Killdeer, California Gull, Glaucous-winged Gull, Pigeon Guillemot,Rock Pigeon, Belted Kingfisher, Northwestern Crow, Common Raven, Purple Martin, Barn Swallow, Tree Swallow, Violet-green Swallow, Chestnut-backed Chickadee, Red-breasted Nuthatch, American Robin, European Starling, Song Sparrow, White-crowned Sparrow, Spotted Towhee, House Finch and American Goldfinch. Two Lesser Yellowlegs, seven Greater Yellowlegs, one Pectoral Sandpiper, two Semi-palmated Sandpipers, Western and Least Sandpipers were seen at the Holden Creek side of the Nanaimo River Estuary in south Nanaimo. A mixed flock of Least and Western Sandpipers were seen at Englishman River Estuary, Plummer Road side in Parksville. Three Black-bellied Plovers were seen at the Shelley Road of the Englishman River Estuary in Parksville. Three Black Turnstones were seen along the shore from the viewing platform along highway 19a in Qualicum Beach. A Downy Woodpecker, Steller's Jay and Bushtits were seen along Dawkins Lane in Nanaimo. Two Greater Yellowlegs, twelve Western Sandpipers, a Least Sandpiper and one Semi-palmated Sandpiper were seen at French Creek. Cedar Waxwings were spotted at Morrell Wildlife Sanctuary in Nanaimo. A Merlin was seen at MacGregor Marsh in north Nanaimo. Seven Common Mergansers were spotted swimming and diving on Cameron lake. Greater Yellowlegs, Western and Least Sandpipers were seen at French Creek. Three Black Turnstones and twelve Black-bellied Plovers were seen at Columbia Beach. A Parasitic Jaeger were seen off-shore at Columbia Beach. A Great Horned Owl was heard singing along Corfield Road near Bridgewater Lane in Parksville. A Brant was spotted swimming with a flock of Canada Geese at French Creek. A Brant Goose was seen with a flock of Canada Geese at Nile Creek. The Sunday Bird Walk on July 25, 2010 will be going to the Beck Creek in south Nanaimo. We will meet at The Backyard Bird Store at 9:00 A.M. or at the parking area near entrance to the Living Forest Campground along Maki Road in south Nanaimo at about 9:30 A.M.. The morning was overcast with a breeze blowing off the Strait of Georgia. We saw two Marbled Murrelets in the bay near the parking lot at the beginning of the walk. A Cassin's Auklet and a Pigeon Guillemot flew low over the water. A Black-throated Grey Warbler was singing near the end of the walk. House Finch and American Goldfinch. An American Wigeon was seen at Buttertubs Marsh in Nanaimo. Common Nighthawks were heard over Lancashire Avenue in Nanaimo. A Olive-sided Flycatcher was heard and seen near the corner of Despard Avenue and Meridian Way in Parksville. An Immature Golden Eagle was spotted soaring over Divers Lake in Nanaimo. 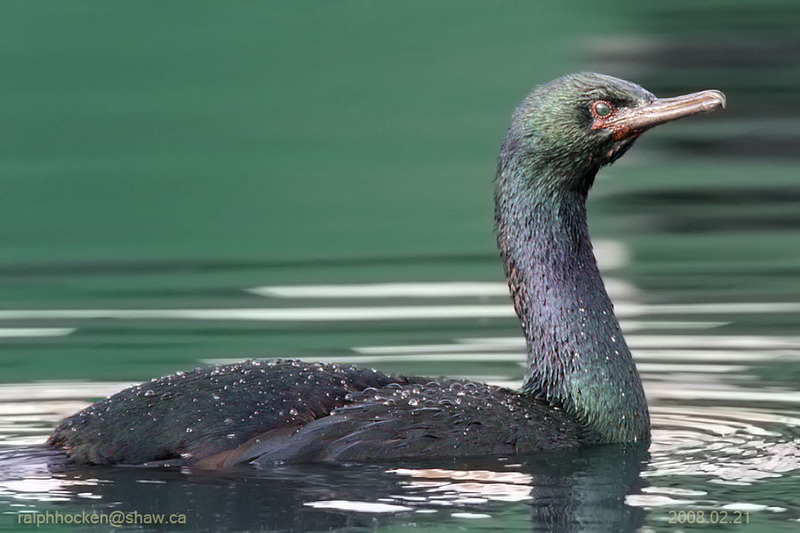 A Red-throated Loon, a Pelagic Cormorant and two Pigeon Guillemots were seen from the Englishman River, Plummer Road side, looking out on the Strait of Georgia in Parksville. 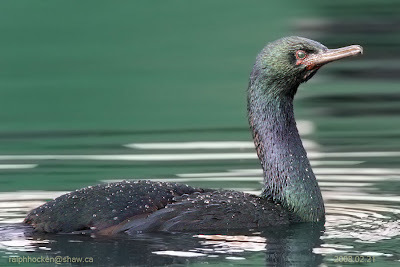 The Sunday Bird Walk on July 18, 2010 will be going to the Maritime Society Marina at Ladysmith Harbour in Ladysmith. 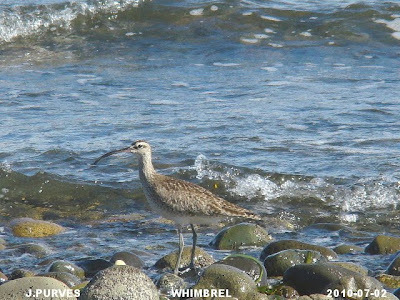 We will meet at The Backyard Bird Store at 9:00 A.M. or at the gravel parking area near Transfer Beach in Ladysmith at about 9:40 A.M..
Whimbrel at Columbia Beach: John Purves Photo. The morning was partly cloudy with calm winds. We saw several Western Tanagers and Cedar Waxwings through out the morning. We had great looks at several Willow Flycatchers singing from perches low down in the trees. There were four Purple Martins and two Black Swifts hawking insects above the marsh. Winter Wren, Red-breasted Nuthatch, Black-headed Grosbeak, Swainson's Thrush, American Robin, European Starling, Cedar Waxwing, Warbling Vireo, Cassin's Vireo, Orange-crowned Warbler, Yellow Warbler, Wilson's Warbler, Black Throated-grey Warbler, MacGillvray's Warbler, Yellow-rumped Warbler, Common Yellowthroat, Pacific-sloped Flycatcher, Willow Flycatcher, Olive-sided Flycatcher, Western Tanager, Spotted Towhee, Song Sparrow, Brown-headed Cowbird, Red-winged Blackbird, Purple Finch, Dark-eyed Junco, House Finch, American Goldfinch and Red Crossbill. Two Semi-palmated Sandpipers among seventy Least Sandpipers and ten Western Sandpipers were seen on the Holden Creek side of the Nanaimo River Estuary. An Eurasian Collared-dove was seen preening itself at the top of the snag on the dyke near where the fence crosses between the tower and the Third Street parking lot. It then flew off over the marsh and the houses on the Bird Sanctuary Drive at Buttertubs Marsh in Nanaimo. There is an Olive-sided flycatcher leading the dawn chorus each day at the top end of Colbourne Drive in Nanaimo. Two Common Nighthawks were seen in Cedar. Two Whimbrel were seen along the shore at Columbia Beach. The Tuesday bird walk went to Springwood Park in Parksville. The morning was mostly sunny but cool in the forest. The Swainson's Thrush and Warbling Vireo were singing throughout the morning. We watched several Willow Flycatcher's singing their hearts out from different perches. A flock of Cedar Waxwings were perched in a tall snag. A MacGillivray's Warbler made a quick appearance. Common Raven, Violet-green Swallow, Chestnut-backed Chickadee, Red-breasted Nuthatch, Brown Creeper, Bewick's Wren, Winter Wren, Golden-crowned Kinglet, Swainson's Thrush, American Robin, European Starling, Cedar Waxwing, Orange-crowned Warbler, Yellow Warbler, Black-throated Gray Warbler, MacGillivray's Warbler, Western Tanager, Spotted Towhee, Chipping Sparrow, White-crowned Sparrow, Dark-eyed Junco, Purple Finch, Red Crossbill. American Goldfinch. A Flock of Red Crossbills was seen in the 1900 block of Harlequin Crescent in Nanoose Bay. A pair of Evening Grosbeaks were visiting feeders at the Nanoose Estuary in Nanoose Bay. Everyone is welcome to join us for a 2-3 hour bird walk on the Sunday and Tuesday mornings. We leave from the Store at 9 A.M. Sunday Mornings and go to a different location in and around Nanaimo and from the Parksville Beach.Community Park at 9 A.M. on Tuesdays and go to different areas in and around the Oceanside area. The Sunday Bird Walk on July 11, 2010 will be going to Neck Point Park in Nanaimo. We will meet at The Backyard Bird Store at 9:00 A.M. or at the parking lot at Neck Point Park off Hammond Bay Road at about 9:20 A.M..